Tenth Grade  - $745.00 : Covenant Home Curriculum - Providers of a complete, eclectic, classical approach, Pre-school through 12th grade curriculum for home educators with a reformed Christian world view., The World's Best Reformed, Comprehensive, Classical, Homeschool Curriculum, and School Administration Provider! To avoid possible academic doldrums of the sophomore year, Covenant Home encourages a true sense of excellence by offering grammar review and further advances in vocabulary. At this level students are expected to write and speak intelligently and interestingly. Thus, our etymology and composition studies continue in language arts. SAT- type analogies are provided to prepare the student for college entrance tests. Two unabridged works of classical literature with study guides are provided. Western Civilization presents a compelling survey of the nations that experienced the greatest blessing and guidance from the 14th century to the present, from the reawakening of the Reformation in Europe to the trials and tests of the modern age. The study includes the CHC History Overlay which introduces the student to overarching themes and perspectives. Students will write a research paper in conjunction with this study. The tenth grade science program is chemistry taught from a creationist perspective. Math studied the Covenant Home sophomore year is Saxon Algebra 2, which is included in the full curriculum. Families also have the option of using Jacobs Geometry. This thorough program gives a classical approach to reasoning, geometric proofs and basic geometry skills. Solutions and Test booklet for Exploring Creation with Chemistry, 2nd ed. 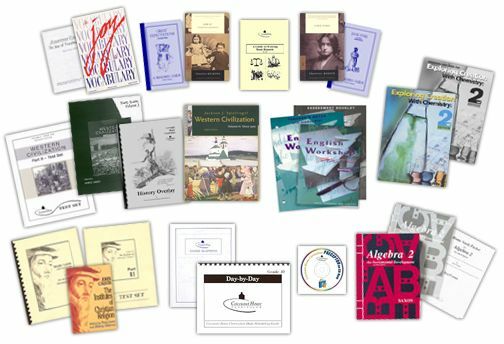 Saxon Algebra 2, icludes student book, Blueprint™, Home Study Packet, and test set.